As of 2018, most budget airlines will now appear in the broad search engines we are recommending. If you want to be 100% sure though, you can do an additional search for regional budget airlines (we’ve listed as many we know of further below). Step 4. On a computer: click “Depart” but instead of entering a date, select “Whole Month”, and then “Cheapest Month” so you can browse all dates to see which is cheapest. Hit “Search flights” to easily see which date is cheapest. In the mobile app: Tap the departure date, then change the view to “Chart”. You can easily swipe left and right to find the cheapest date, and tap on one of the bars to see the price. Repeat these steps for your return flight if applicable. 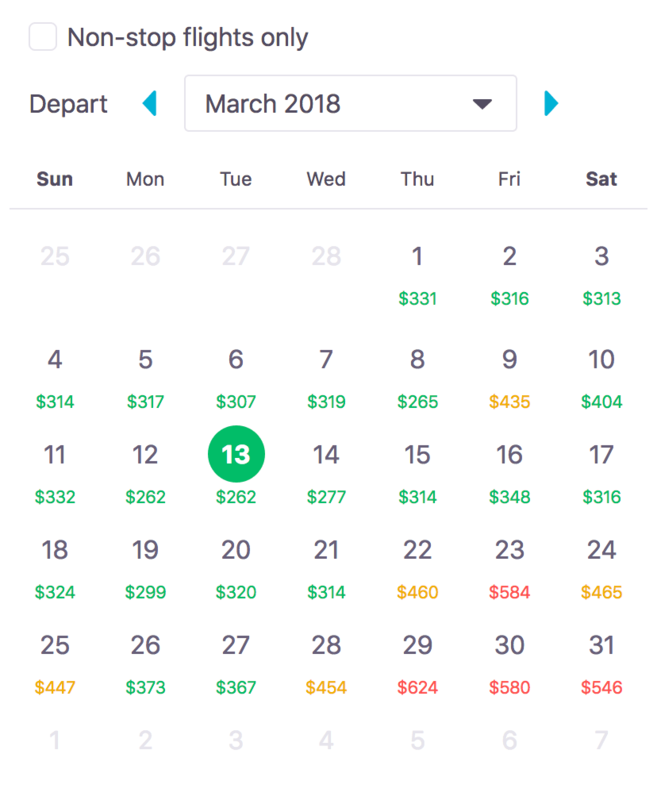 You can still book a round trip in one booking, but doing these steps first will let you see which dates are generally cheaper to fly in/out on for your round trip. Kiwi.com and Google Flights work similarly to Skyscanner, plus they have map views as well, so you can see where the airport is. For tracking when and where is cheapest to fly, Hopper also offer price analysis and track fluctuations (i.e. when is best to fly). If you are considering flying budget, which in our opinion is a great way to save, I’d highly recommend reading our guide on 7 must-know facts about budget airlines. Below is a comprehensive list of budget airlines around the globe. Red indicates true budget airlines while blue implies the cheapest companies available where budget airlines don’t exist or aren’t plentiful. Ensure you’ve booked & paid for your luggage allowance. Adhere to restrictions on weight, height, and # of bags allowed. Some airlines (e.g. Ryanair) will charge hefty fee if you’re over. Remember, paying only for the exact luggage space/weight you need is how budget airlines keep their prices lower than traditional airlines! Remember, if you want to book the cheapest flight possible (not service-of-the-year-award-winner), be adaptable, do your research, and know the budget airline’s requirements & restrictions. If you’re heading to any of these parts of the globe, start stalking these airlines. Use Twitter, Facebook or regularly check budget airline webpages to keep you in touch with specials before they sell out. Air Asia, Jetstar, Tiger Air and Ryanair are especially good at having regular deals. On a side note, Wikipedia has a more detailed, comprehensive listing of low-cost airlines down to specific countries here, though I don’t find all of them to be actual discount airlines. If you’re going to a specific country, it’s worth checking so you know all your options. If you’re flying somewhere that involves a transfer, say from Canada to Australia which typically involves Canada to LA, then LA to Australia, consider that it may be cheaper to book these two legs separately on your own by adding another destination to your trip. It should go without saying that in doing this, you should not book tight layovers. I repeat: do not book layovers that are hours apart! This approach is for those who want to create an additional destination of a few days or more, before catching their next flight. The one exception is when booking with Kiwi.com, who offer their own guarantee on making connecting flights even when not with the same partner airlines. First, do your research: are there budget airlines unique to the country you’re flying out of and where you’re headed to? 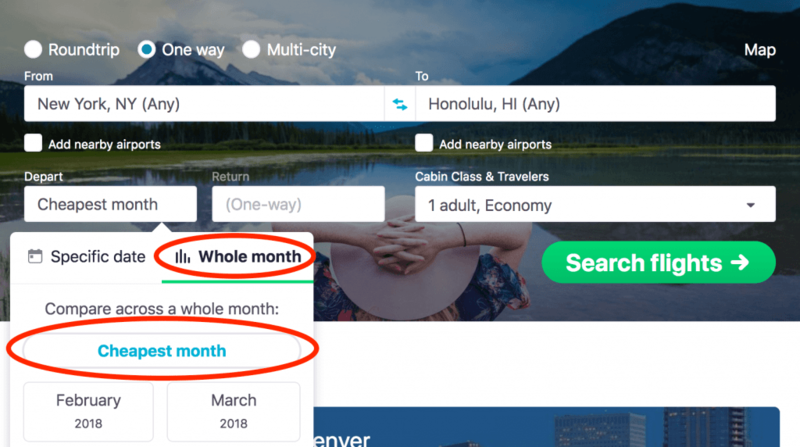 Booking with a budget Australian airline (Jetstar) from Sydney to Honolulu, then an American one from Honolulu to Montreal saved us over $400 each when flying back from Australia to Canada earlier this year. This allowed us to create a thrifty five-day stopover in Hawaii on our way back, which was less exhausting and a lot cheaper! Kiwi.com and AirWander are both great search engine for revealing cheaper routes like this that involve multiple airlines. Kiwi.com, on the other hand, will mix and match airlines (including budget airlines) in order to find you the very cheapest route. For long-haul flights especially, this can make a huge difference. The same search on Kiwi.com returns a route at $459.80 USD via JetBlue, Norwegian Air, and Vueling. That’s a savings of $171.40 USD, and the travel time is even shorter! Typically, booking a whole trip with different airlines would be risky. For example, let’s say your first flight with JetBlue was delayed, and you missed your connecting flight with Norwegian Air. Because the airlines have no association with each other, Norwegian Air has no obligation to reschedule your flight for free, so you would just lose your money. Kiwi.com instead offers their own guarantee, which covers schedule changes, flight delays, and cancellations. As long as you contact Kiwi.com as soon as you’re aware of the delay, they will provide you with an alternate connecting flight, or a full refund, at your discretion. We haven’t used this guarantee ourselves, but it certainly sounds like an appealing way to take the risk out of a thrifty flight hack! You can also take advantage of this on multi-city flights. For example, Virgin Atlantic has routes from New York City to London, London to Shanghai, and Shanghai to New York City. If you book all these at the same time using the multi-city search function on Skyscanner, you’ll save some serious cash. Our detailed how-to guide spells out how to find mistake fares easily on your own. Basically, AirFare Watchdog and Secret Flyingare great resources to stalk for finding mistake and sale pricing as they conglomerate slashed ticket rates all in one spot. Another great approach is to search for flights for an entire month using Skyscanner (Tip #3 in this article). This will allow you to easily spot a significantly reduced fare against what’s displayed that month, and has twice helped us stumble on error fares ourselves. Below is a real-time list of today’s top fares from AirFare Watchdog. While the above search engines are great, they do not always include small airlines, especially in less popularly booked routes and/or in remote regions. If you’re flying somewhere obscure, Google search and ask around if there exists a local airline. While in South America we learnt that the LADE Air in Argentina (run by the military) has cheap flights to Patagonia, which is of course not listed in mass search engines online. Before booking a flight, consider if the rate is cheaper if paid in another currency. Often budget airlines will make you pay in the currency of the country you’re departing from, but this isn’t always the case. An important note when doing this: make sure you’re using a credit card that is free of foreign-transaction fees, otherwise your attempts to save money doing this will be lost! Our article on money matters for world travellers can help steer you in the right direction for the best credit cards for travel. There is now a web search engine which finds hidden city tickets for you. It’s called Skiplagged and is currently being sued by United Airlines who is angry about this debatable hack. We have never used the hidden city approach, but I know several who have, and they’ve scored some thrifty savings. Use at your own risk! If you’ve inadvertently forgot about those Aeroplan or Air Miles points you’ve been racking up for years, now’s the time to use them! For Canadians using Air Miles, the best bang for your buck is to use your points for in-country travel, as this uses the least amount of points for the distance, though if you are swimming in points (company credit cards can be a goldmine for this), this is a good way to save serious bucks. Do you have some sneaky techniques to save big on flights? Any budget airlines you see missing here? Share below to spread the thrifty love! And for more guides like this, like us on Facebook, Twitter, or subscribe to our newsletter!